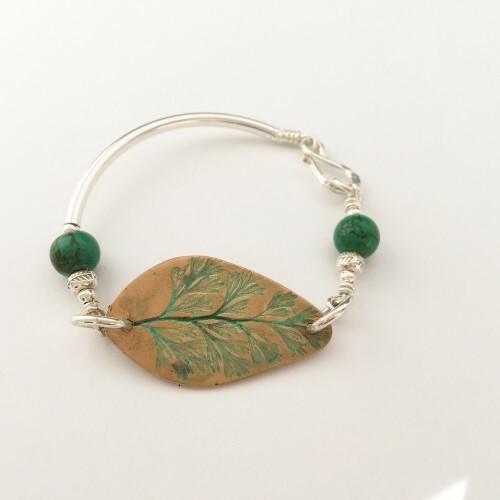 A new design that is made in a similar way to the Bronze Leaf Bracelet, except that a fern imprinted bronze leaf is incorporated instead. 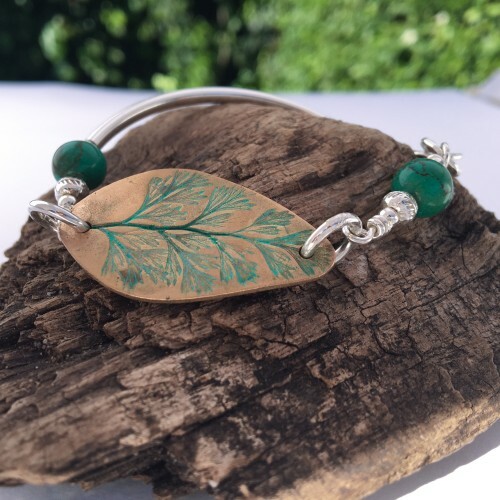 The fern imprint was taken from a real fern leaf and is layered with a deep green and turquoise patina, which is sanded back to expose the warm bronze colour on the leaf. 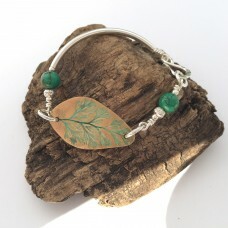 The leaf measures approximately 3.7cm long and is fitted to two chunky sterling silver jumprings, that connect the leaf to the rest of the silver bracelet. This piece has only one sterling silver tube and is fitted with a beautiful hammered sterling silver clasp and jumpring on the side , for easy putting on and taking off. The bracelet is adorned with two gorgeous deep green turquoise beads that really complement the fern leaf and contribute to the bohemian look of this piece. The bracelet is small, with an approximate diameter of 5cm, which would fit a small wrist size.